One area where CSR stakeholder engagement/management has been very effective is in managing corporate supply chains. For most businesses but especially for retail, the supply chain can be very comprehensive and might include several tiers before arriving at the primary supplier (Halldorson et al, 2007:286). In a CSR context the supply chain represent a unique set of challenges as it stretches the moral responsibility of the corporation outside its direct sphere of influence. It has been proven time and time again that even though the company might not have direct management control they are still held accountable for the decisions made in their supply chain both up and downstream (Austin & Reavis, 2004, Baron et al, 2004). Effective supply chain management encompasses much more than just CSR issues but the idea of sustainable supplier relationships are becoming increasingly important. Where time, quality and price used to be the drivers for the logistics chains more and more companies are finding out that the “how” of production and transportation is on the “radar”. The question of how goods are produced and transported becomes most salient when companies start to source into areas where different management cultures, labour laws or governance practices are in place. Issues that companies in one part of the world take for granted is something that people need to fight for in other places. The challenge then becomes how to manage this diversity over a string of different supplier and customer relationships. A common approach adopted to manage supply chain is using Code of Conduct to gain some form of control over the suppliers (Vogel, 2008). Even though it is far from a foolproof system it does present a platform from which the company can get an overview and thereby a possibility to manage its organisational risks in its supply chain. For retail businesses a systematic system of information gathering, risk analysis and auditing is essential and will always have to be a cornerstone of CSR efforts. When working with CSR we like to believe that there is a cause effect relationship between the activities that we engage in and the results we can measure. But we often overlook that it is the secondary results that represent our greatest achievements. Most organisations look at the direct effects of communication technology like CSR systems and efforts to introduce sustainable technologies with a communication component. There is no doubt that there persist other perspectives on how organisations can achieve sustainable business development but in all cases is the communication part central. To illustrate one can look at CSR as part of the branding strategy of companies that in order to boost their image advocate their products as green or sustainable. This I will characterise as a 1st order communication strategy like a cause-effect system of meaning. We can look at communication technology like CSR as “what management wants”. This can be decentralisation into global teams, working from home systems or technologies that enable projects to work cross boarders. The common denominator for these communication technologies is that they enable people to process more data more efficiently or/and with greater ease. However it is often the side effects or secondary effects of the introduction of a CSR systems approach that have the greatest impact on business development, an effect that is often ignored or underestimated in the original prospect. So what management wants is often not what management really gets because the secondary effects outweigh the first order ones. So what does management need to look out for when implementing a new technology, like CSR. First of all one should not underestimate the effect of cultural changes. Organisations cant implement a new technology without assuming that people will do their tasks differently meaning that they will use or at least relate to the introduction of this new process that is presented. They do not have to embrace CSR but the presence of systems that coerce employees to relate to something than them selves will force a cultural change no mater what. One could say that CSR questions the status quo forcing employees to ask themselves; “who are we as and organisation and how do we interact with people outside”. Another effect closely related to cultural change is the raise of new types of conflicts. When people question their own ethics they will natural also question the ethics of their fellow employees. This give raise to conflicts that relate to our understanding of the consequences of how we interact and do business with customers or other stakeholders. Are we really doing good? Or are we only doing well? Just look at the banking sector that for a long time did not ask these fundamental questions, but almost exclusively used CSR as a means create a image of “goodness”. But when the ethics were questioned an internal conflict erupted questioning the very fabric of what the business was all about which was mainly grounded in CSR or Ethical framework of understanding. Lesson is that when starting on the path of CSR it is not only that directly related effects of the system that one needs to take into account of, but also the changes that comes with thinking differently about the organisation. If you ask the organisational members to think (and I mean really think) about the consequences of their actions one should take this into account when embracing a technology. CSR asks employees to think and react to consequences of the actions. So be prepared to embrace rather their input rather than only thinking of CSR as a way create a better image of the organisation to outside stakeholders. Here is a video by Edward (Ed) Freeman on stakeholder theory and what he means by organizations need to engage with the community, customers, business partners and other interested parties. I think the stakeholder theory is central to the concept of CSR and if one wants to understand business ethics, corporate governance, triple-bottom line, and other concepts within the CSR discourse one also need to understand how stakeholders and stakeholder theory plays a central part. Enjoy. So is CSR an exercise in the effective management of systems or is all about communicating on the go so to speak? Being an “old” systems person I have always favoured systems over the ups and downs of communicating on a case by case basis. But even I have to admit that systems will not do the trick on its own there need to be some form of room to manoeuvre. On the other hand one should not think that organizations can communicate their way of out of everything so here is a short and incomplete list of things systems will do which “communicating” alone will not help you with. Of cause one can always argue that systems are communication just in another form but in this case I will keep the two separate. CSR Systems will create consistency. Creating effective management systems is all about creating rigidity in the organisational processes. One should not look at systems as something completely static but as a way that management can ensure that there is some form of strategic direction and that the odd case will not distort the whole organisations approach. For stakeholders this means that there is some form of consistency when dealing with the organisation. CSR systems is organised learning. People change but systems remain in place. This process ensures that organisations are able to learn and develop regardless of the people within its walls. The day when employees stayed within the same company until retirement is long gone. Today people change jobs much more frequent sometime within the organisation but frequently they change organisations as well. Even though companies have elaborate programs for retaining their employees there will never be a employee loyalty program that will not be matched by something better. Systems are control. Not all employees will think that the strategic interest of corporate management is inline with their own desires. And while systems are not able to change peoples mind they can coerce employees to act in a certain way that management wants them to. Systems are effective. Of cause they are otherwise we would have found another way of organising our processes and knowledge. Systems help organisations become more effective at what they do but they do not help companies come up with new ideas or create new ways of addressing new problems. Sometime management will confuse systems with efficiency in all the issues that their organisations are dealing with. A “systems only” approach will normally results in miscommunication and loss of reputation as systems do not confront current issues but are rather a collection past experiences and learning. I was inspired by the headline Is GRI Too much transparency for NGOs? Which was posted on prizmablog.com and it made me think about how information is managed and how far we are from learning from each other’s mistakes in both the business and NGO/CSO world. When I started in the field of business intelligence in the late 90’ties information of God, or at least we had a religious belief around information. All we wanted was to get as much information as possible little did we know that information would eventually make us inefficient and create weak decision-making systems. In the transport industry was one of the main problems to know were stuff were? We transported ‘stuff’ all around the world with multiple stops along the way. When we wanted to know were ‘stuff’ were we needed to one see if it arrived at the destination or two pick up the phone and start asking around. In one instance I had a package going from Vietnam to Copenhagen and it was lost and had not arrived on time. So I used a day calling the different stations along the supply chain all the way from Copenhagen to the different logistics hubs along the way all the way to south East Asia. In the end I got a hold of somebody in the Hanoi office and she might be able to help me out, but not until the day after because they only had power two hours a day so that she could use the computer. The next day I finally found my package in Belgium, but that is a different story. The point is that we needed easy access to information and we needed it now. We had screaming clients in one end, and massive waste of man-hours in another and the solution was apparent to as all, we desperately wanted to know what was going on. The company was loosing both money and clients and at an alarming rate. To our benefit could be said that all our competitors was just as bad us so it was a level playing field. So we started an information gathering project. All our packages had a barcode on them and that would form the backbone of our tracking service. All employees that handled packages were issued with a system for scanning and creating digital reference points. All in all, we figured that one package that were either shipped or received from outside Europe would receive somewhere between 30 and 50 checkpoints, as we called these reference points, along the way. In 1998 we hit the implement bottom and in a matter of days we were overloaded with information, which we knew we needed but we had no system for handling. Basically we became hugely inefficient and the system was extremely expensive to implement and we were unable to determine if we were taking right or wrong decisions. Just imaging the cost of scanners and computers that was needed to get all the equipment installed around the world, not to mention the man-hours. On top of that we had of cause a need to upgrade the electricity supply in Vietnam, so that they could transmit and retrieve data. Later one we found out what to do and had training and systems in place for handling the incoming data but the starting point was nothing less than a disaster. So when one asks if the NGOs are able to handle the information they themselves have been asking for, my hypostasis would be that it’s a big NO. At least we had the benefit if knowing the business and its inner clockwork of the organization. The NGOs have no such perspective and the chance of miss interpreting data and making huge mistake are ever present. What is needed it in my mind effective communication/information management. 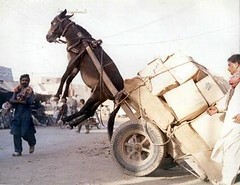 The transport business of 2011 is much more advanced than it was when I started and in the end left. The track and trace systems of today are much more intuitive and ‘Google’ inspired which really creates value for customers and transportation companies alike. The NGO or other organizations interested in transparency have no such system for handling data and have no experience. When I left the company some six years ago it was producing well over 10’000´000 checkpoints every day around the world at tens of thousands of locations. How in the world would a NGO be able to handle just 1% or even less of that information? The GRI provides some individual 129 headlines, which in some way tell something about the company from economic data to its status on environmental impact and Human Rights. In a normal GRI report one would properly have somewhere between 500 and 3000 checkpoints. There is no way in my mind that NGO will be able to effectively use this data for anything than individual company analysis and spot checks without an effective information management system and training in how to use it. So my small piece of advice is to think before you hit the implement bottom and get overwhelmed with information that you have no chance in the world to manage anyhow. Instead one should sit down and find out what information is needed, how we are going to handle it and what are we going to use it for. From there the NGO or other interested organization can systematically create databases of corporate GRI report data that is actually useful.